Kennet Artists Network is a new site that hopes to forge connections between art lovers, artists and associated trades. The idea is to exchange news, reviews, comment and ideas for mutual benefit and (dare we say it in the sometimes too earnest world of art) fun. 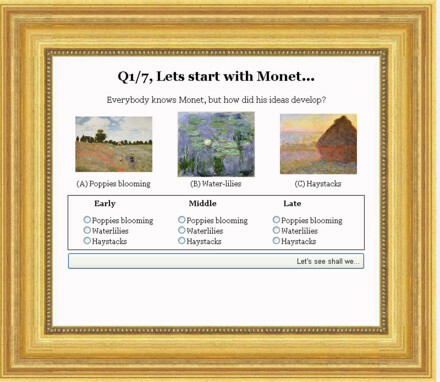 So here is a starting snippet - a little coffee time fun in the shape of an art quiz. It's quite a tricky little number and you can find it on the site of the well known on-line picture framers p ictureframes.co.uk. The subject is the different phases some famous artists go through in their careers - see not the usual 'who painted this'! See the snapshot above.